Your Flagship® First ticket gives you access to our best and most exclusive amenities and services; available for international flights over 3,000 miles. Enjoy true First Class service on our Boeing 777-300 and 777-200. Every seat is fully lie-flat with aisle access so you arrive feeling refreshed. Never miss a beat while you’re on board with international Wi-Fi on select aircrafts. American Airlines has partnered with big names in food like Mark Sargeant and Maneet Chauhan to inspire menu items on select premium cabin flights. Plus, you can pair your meal with our award-winning wines. You can reserve your meal on American-marketed and operated flights with scheduled meal service when you book 30 days before your trip. The reservation window stays open up to 24 hours before departure. Our premium cabins are stocked with a wide variety of complimentary beers, wines and spirits to complement the inflight menu and your destination. Each wine we serve goes through an extremely selective process as part of our award-winning wine program. 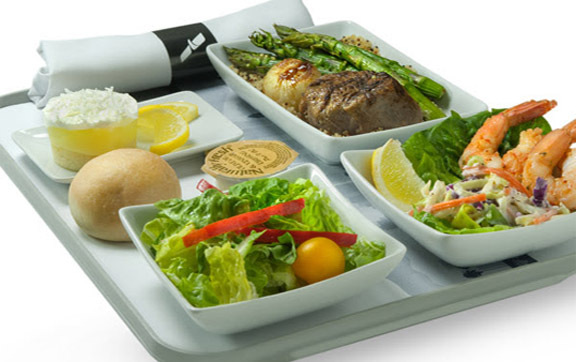 American Airline’s First, Business and Premium Economy meals are healthy, delicious and customized to your travel – menus vary depending on when and where you’re traveling. Pass the time with free entertainment and Bose® QuietComfort® 25 Acoustic Noise Cancelling® headphones. On select aircraft you’ll even be able to watch live TV. Be pampered with travel essentials from leading skincare and lifestyle brands 3LAB and Cole Haan. Save some space in your carry-on –American Airlines have got comfort covered with pajamas for you. When you’re ready, turn your fully lie-flat seat into a bed with the complimentary pillow and blanket provided. 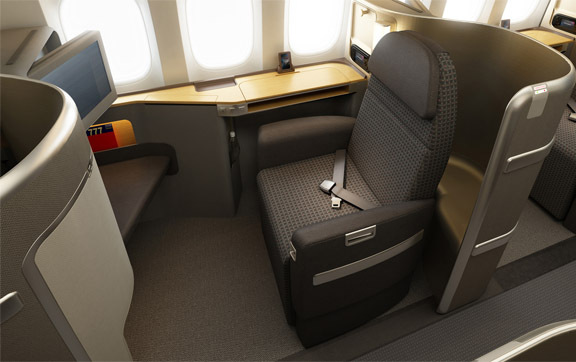 Welcome to the new American Airlines Business Class. 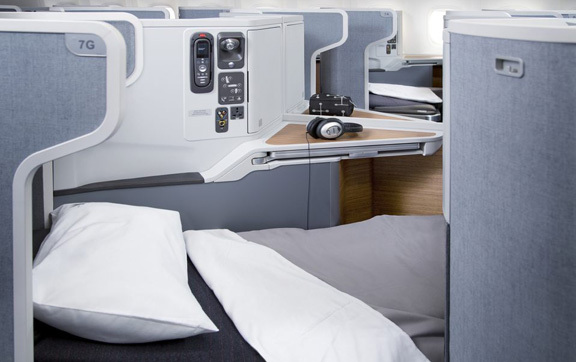 The new cabin design, seats and entertainment upgrades are available on all 767-300’s and 777’s. Your seat is at your command to provide maximum flexibility and control. Choose from several pre-set positions or fine-tune the fit using individual electronic controls to adjust the seat back, seat cushion and leg rest to your exact preference. Lean back to relax, sit up to work or lie flat to get some welcome shut-eye. And in between, if you want to find your favourite position again, use the convenient memory feature. Enjoy exclusive access to Business Class Lounges when you fly with American Airlines. For more information regarding American Airlines Lounge Access, please contact one of our Travel Specialists. AMR Corporation is the parent company of American Airlines and American Eagle Airlines. Headquartered in Fort Worth, Texas, we are one of the largest airlines in the world. American Airlines is also one of the largest scheduled air freight carriers in the world, providing a wide range of freight and mail services onboard American’s passenger fleet.